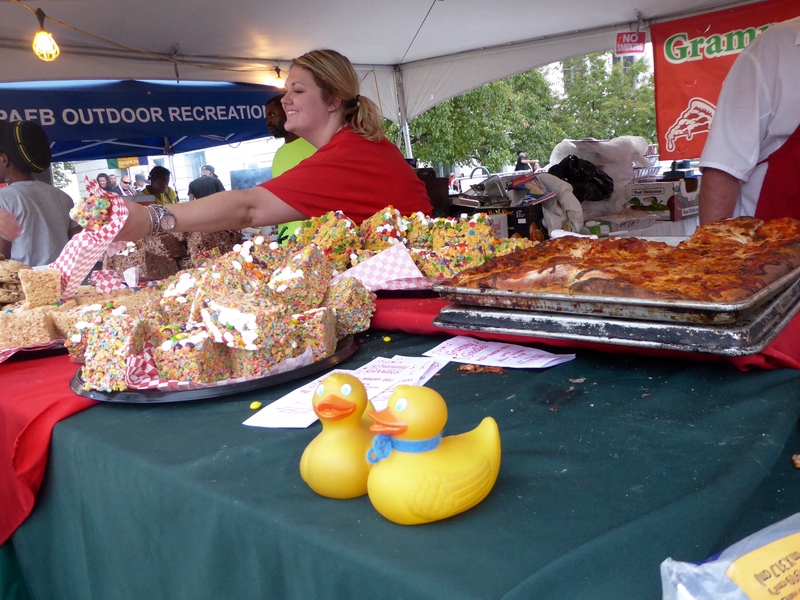 A Denver end of summer tradition is the 4 day food festival called A Taste of Colorado. Zeb and Soapy went Monday, Labor Day. 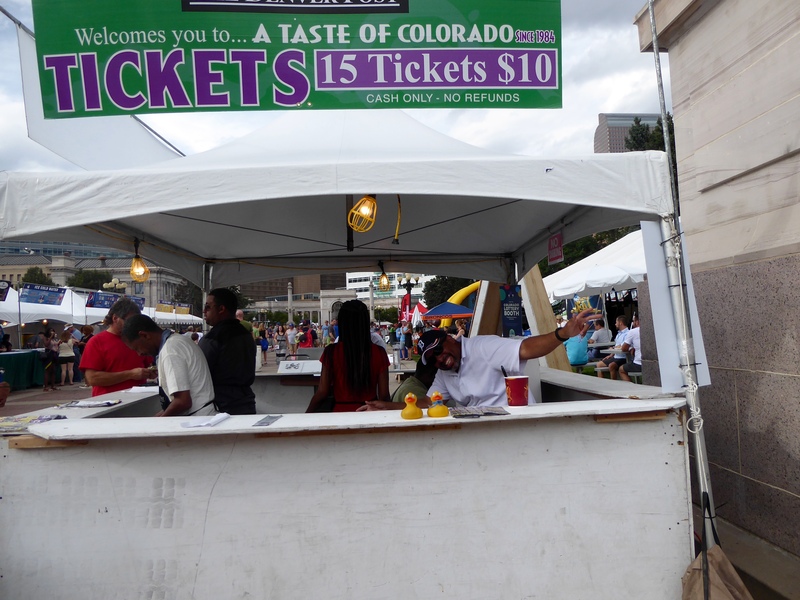 This was the 32nd year for A Taste of Colorado. This year there were over 50 of Colorado’s favorite restaurants and hundreds of additional booths. The music from live bands was great. 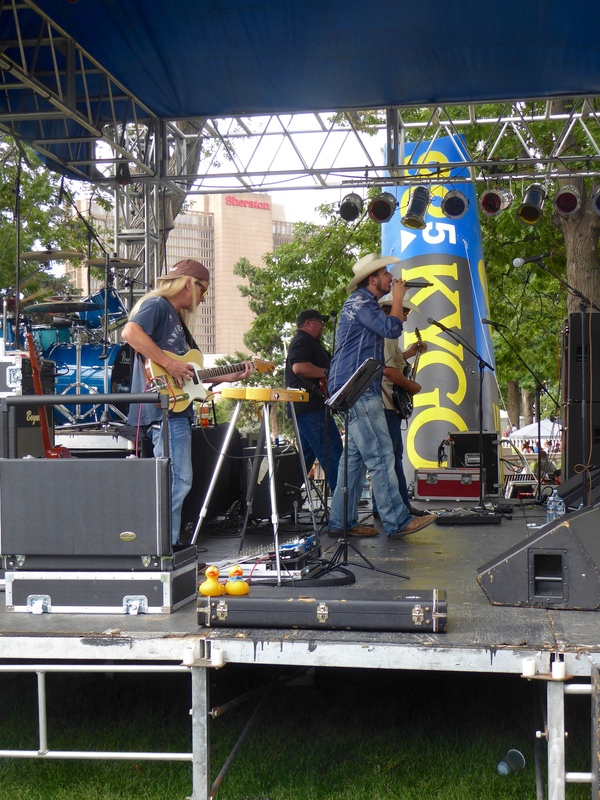 Our first stop was to hear the Richie Law band. The crowd was dancing and everybody loved these guys. We especially liked the guitar player. 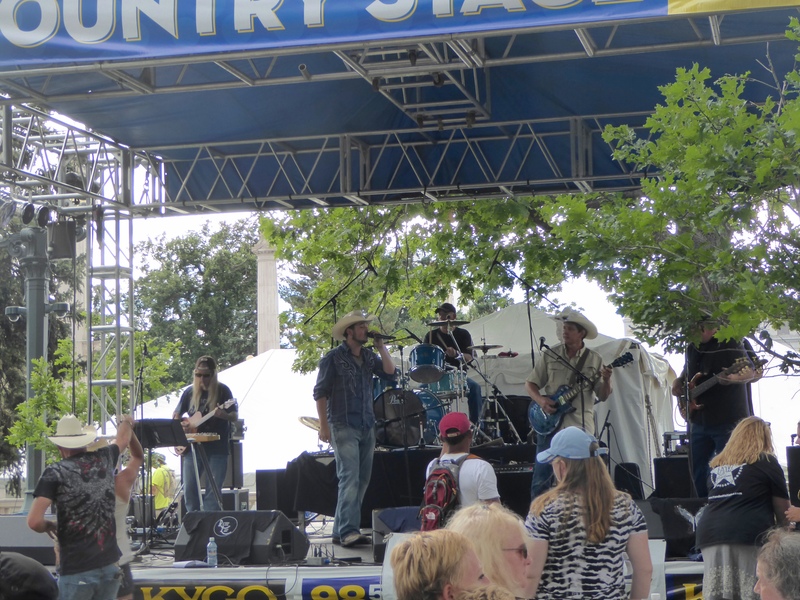 He used to play professionally in Nashville and toured with various bands. He is really good. And, he is Soapy’s dad. But, this is a food festival, so let’s eat. We bought and enjoyed grilled steak – churrasco from Rodizio Grill. We ate it before the humans remember to take our photo. But, it was really good. 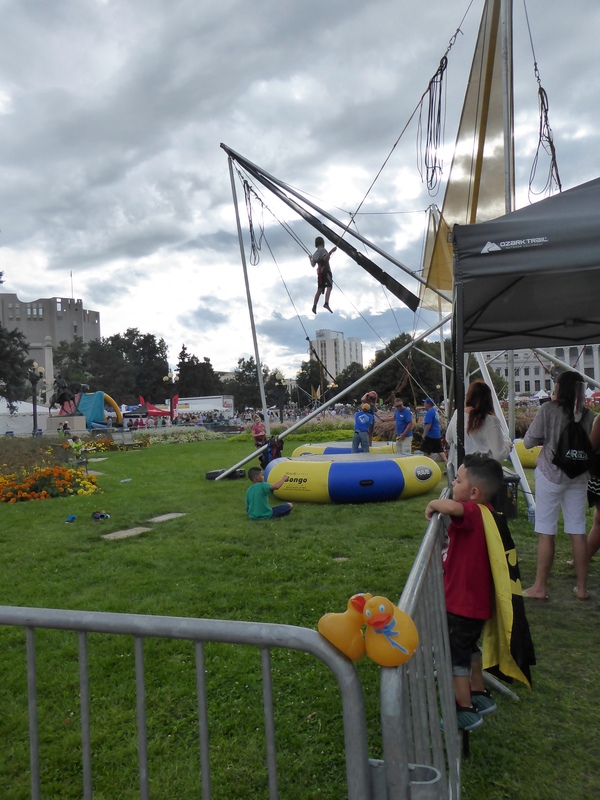 Then we watched these young humans jumping and laughing with EuroBungy Colorado. Great time for kids. Look at these dancers. 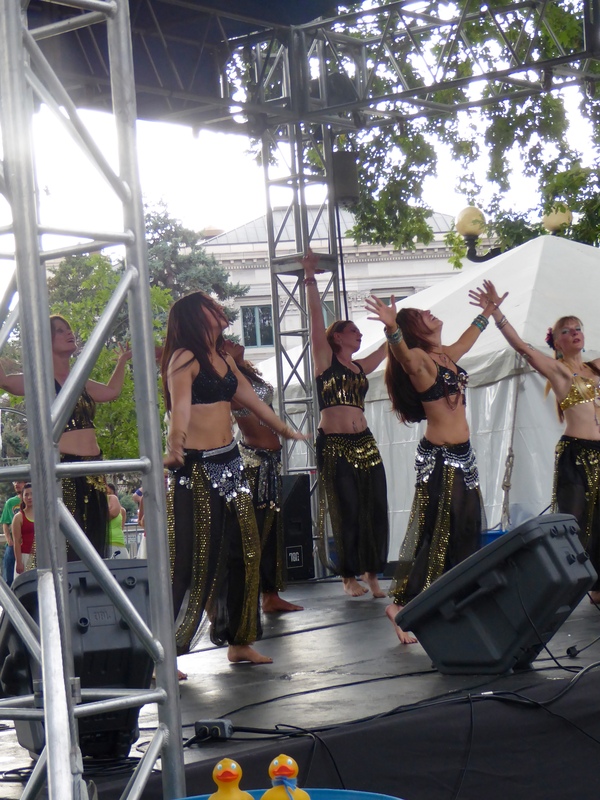 This is Bella Diva Dance and they are good. We like them and the crowd really like them also. 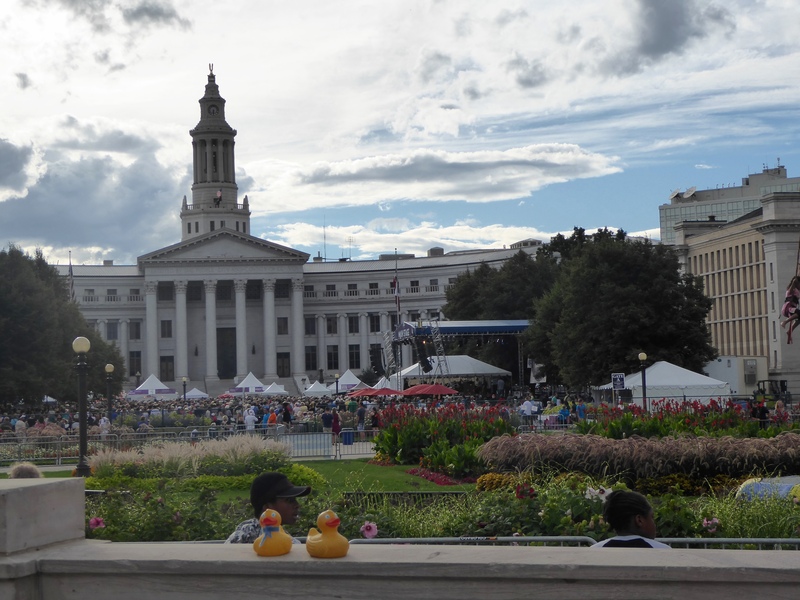 This festival is held in Civic Center Park, a huge park between the Colorado Capitol Building and Denver’s City and County Building. There are thousands of people here, but it does not seem too crowded, except maybe in front of the main stage to see Bruce Hornsby and The Noisemakers. The Albert Bartlett Culinary Show takes place here. 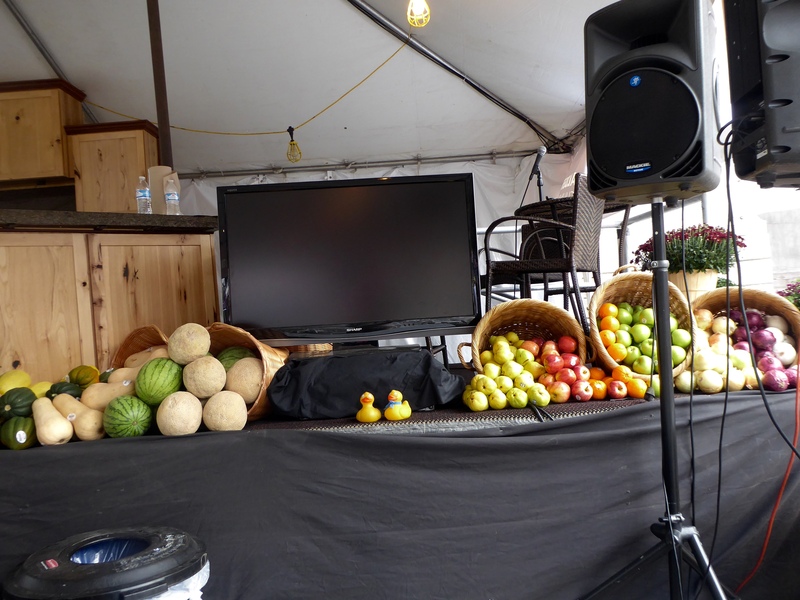 Great produce. This is making us hungry again. 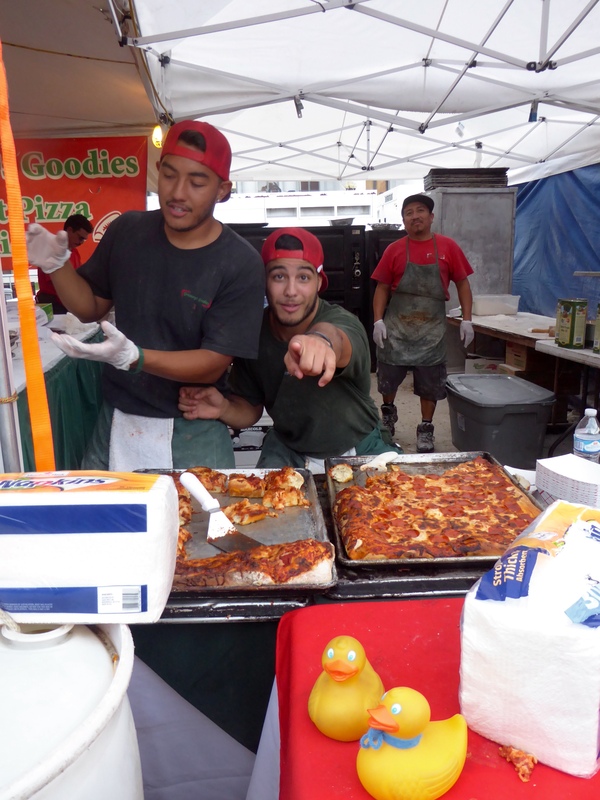 Since this is a food festival, soon we will show you some of our favorite food booths. 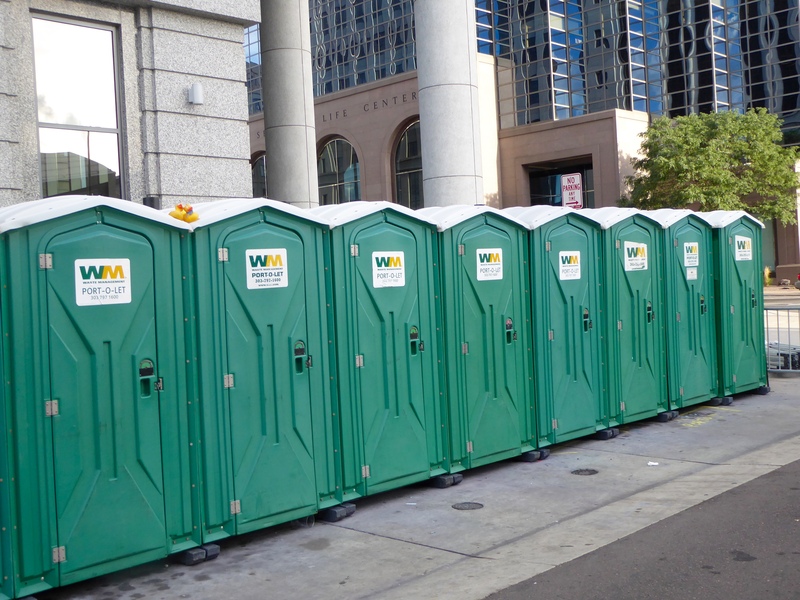 You can imagine with thousands of people and so many food and beverage booths, some relief stations would be necessary. This is just one of several locations. 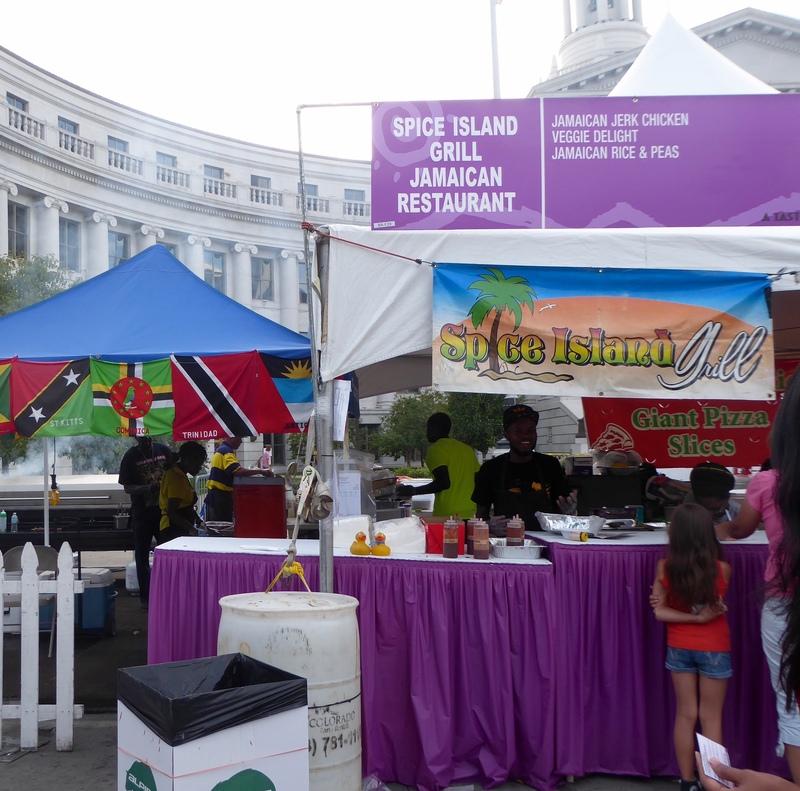 We like Spice Island Grill and the Jamaican Jerk Chicken. The international looking seating area was a great addition for us. Here at Grammy’s Goodies, we savored a huge chocolate chip cookie. These giant Krispy treats and slices of pizza are so tempting. We really thought these guys were great. They showed how to toss and make pizza crust with a short song and dance. We like them a lot! 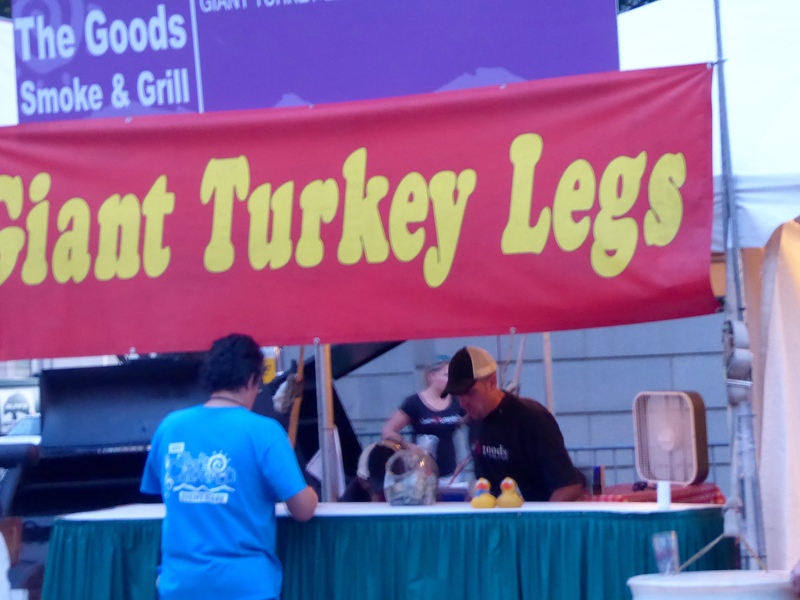 For information about Grammy’s Goodies, visit http://www.grammysitaliangoodies.com And, of course, no festival, food or otherwise, would be complete without the Giant Turkey Legs from The Goods Smoke and Grill. Everything looked and tasted so good. We are so full and so happy. We hope you visit a food festival soon. It is fun and yummy! This entry was posted in Colorado, Uncategorized and tagged A Taste of Colorado, Bella Diva Dance, Colorado, Colorado Traveling Ducks, Denver, Grammy's Goodies, Richie Law Band, Rodizio Grill, Spice Island Grill, The Goods Smoke and Grill. Bookmark the permalink.